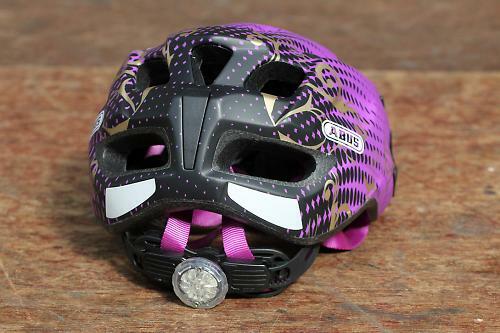 The Abus Mount-X children's helmet stands out in both looks and features. The first thing I noticed about the Mount-X is the stunning matt colouring on our test helmet. Staying away from shiny-shiny gives the standard in-mould EPS helmet a classier look than its shelfmates. First impressions were supported by examination of the features. At the back of the helmet is an easy to use Zoomlite adjuster dial, which serves a dual purpose. One easy press and four LEDs give out a surprising amount of red light, another touch and they pulse. 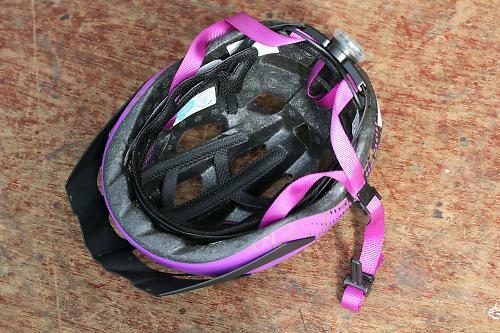 While your kid shouldn't use it instead of a bike-mounted back light (legally required when riding on the roads at night) this is a safety feature that justifies this lid's higher price. Little fingers found it easy to use while wearing the helmet and as anyone who has been shoe shopping with a child knows, integral LEDs add serious kudos to any piece of kit for kids. Two good sized reflective stickers at the back complete the look of this lid. Fit is all important, and the under chin ratchet buckle combined with a generous pad means that catching your little one's delicate skin is much more difficult than with the usual snap-lock buckle. The pad also meant that the helmet was comfier over longer rides, so my mini-tester was less likely to try and remove it mid-journey, even putting up with it for a 16-mile spin on the tandem. Under-ear sliders allow for quick and easy adjustment although they were a little stiff to use compared to other brands'. Padding is minimal and this is where the Mount-X loses a point in the overall score. This is a performance helmet at a premium price, as kids' lids go, and though our little tester made no complaints over comfort, mum's greater experience on the road tells me that a thicker, softer pad would have been money well spent in the overall execution of this helmet. Ventilation is good, with 15 vents and a bug net, in keeping with the performance aspect of the Mount-X. The vents are connected by deep air stream channels which should pay dividends on longer rides as we get into the summer. Of more use recently would have been the additional rain cover which can be purchased separately. We tested the S/M helmet, which was for a head circumference of 48-54cm, or about 3-6 years old. There is a larger M/L for approximately 7+ which measures 53-63cm. A high end kids' lid with German technology, which stands out from the pack. The Mount X is a smaller junior version of the premium adults' mountain bike helmet the Hill Bill. Based on the same design this is a performance version of the helmet for children or youth, the Mount-X benefits from In-Mold technology. Designed with 15 vents, including bug mesh this helmet will keep the rider cool & safe. Ideas from high end adult helmets have been used for the Mount-X. Not accident tested, luckily, but the additional safety from the bright LEDs and reflectives makes this a stand out product for children. The batteries in the lights can be easily changed. Lighter than many other offerings in the size range. A light lid with easy adjustment. More expensive than other kids' lids, but a case of you get what you pay for. The integrated flashing/steady led light. The padding could have been softer. Would you consider buying the product? Yes; I'm buying one for one of my children. I'd like an adult version please.